Druza asks you to go to Merchant Erfila and buy a Mining Cap. It's free. Stolgo sends you to talk to Spiritmaster Lesha who binds you and sends you to Coachman Doba. Stolgo wants you to head to the quarry and hunt rats and return to him with three smithing stones. Stolga wants you to slay the frosteye shamen that are in the area. 1. Talk to Druza, she sends you to Logger Kripp outside the city. He's found in a house on the road. 2. Logger Kripp sends you to kill The Red Eyed Monster(CONs Wht-Red), which is found northwest of town, right across the river. Kill, loot his eye, return to Logger Kripp. 1. Talk to Druza, who sends you to Bren Raven, who is located west of Moradhim, in Diren's Hold, inside the fort, go all way back, on the second floor of the tower. 2. Bren Raven sends you to disable all 3 mines along the river. Start at the dam, and make your way up the small river. At each encounter your quest will update and tell you that you must stay in the area you found the mine for 30 seconds. A level 10 goblin will attack you each encounter during the 30 seconds, kill em and move along. After disabling all 3 mines return their springs to Bren. 1. Talk to Druza, who sends you to Baga Village to kill guards. 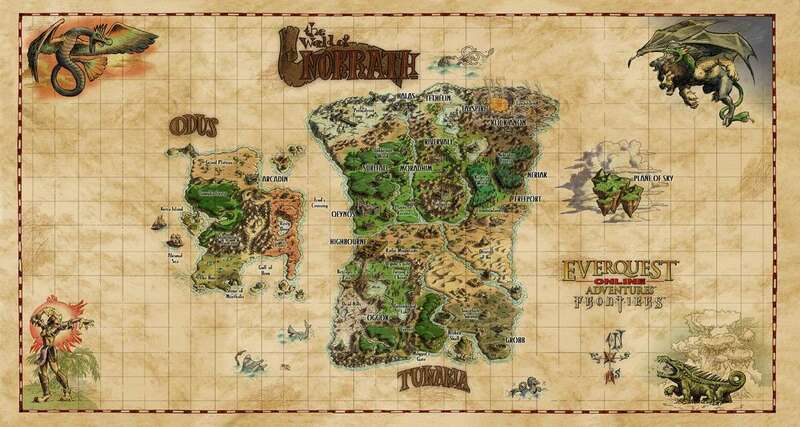 From Mordadhim, head south to Baga Village zone, Find the village and kill guards till one drops an Oversized Claw. Loot, return to Druza. 2. Druza sends you to a Named-human-NPC in the Enclave of the Bear. From Baga Village, follow the south mountain (from the back-side of Baga). It will wind West and East a little. It's in the SOUTH part of the Baga Village zone. You will see a ranger tree-tower outside the cave entrance. -OR- To find the Enclave run straight through Baga and follow the mountains to your left all the way. At the end of the mountains is the cave entrance to the Enclave. 5. Return to Druza for your rewards. 1. Druza sends you to Kairan in the hidden village due east of Moradhim, which is Shon-to Monastery zone. Head out to the coach, and then turn directly East and follow that path until you come to a lake. You will be in the Shon To Monastery Zone. Across the lake, you will see a tunnel that you have to go through. on the other side of the tunnel is the village Chiasta. From the tunnel entrance on the other side, you will want to bear south, and look for an oriental-looking building. Kaiaren will be on the left side. 4. Kairan will then give you a letter to give to Druza. 1. Foreman Druza sends you to Elder Joram in Halas. Joram is in the bank.